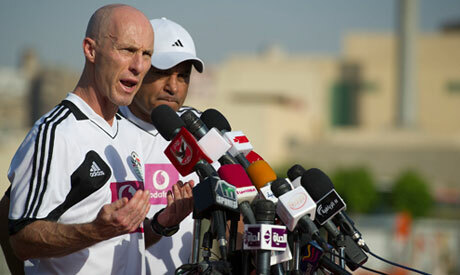 American manager Bob Bradley has announced his readiness to leave the Egyptian National team "if it benefits the team." The 54-year-old coach made the statement following harsh criticism by fans after the Pharaohs were defeated 3-2 by the Central African Republic last Friday in 2013 African Cup of Nations qualifiers. "I have no problem leaving Egypt if the Football Association decides that, but I came here to fulfil the Egyptians’ dream of qualifying for the 2014 World Cup in Brazil,” he told Egyptian state news agency MENA. Egypt, winners of seven CAN trophies, must win the second leg in Bangui on 30 June by two goals to progress. Bradley, however, insists that they "are on the right track and are able to win." "I am the only person responsible for the defeat," Bradley concluded. You can lead Egypt, you have been making vast improvements. I loveeeee your attacking style. It is something the players need to learn. But the defense played horrible! It was almost as if they were scared to make a tackle. Look at Guniea's second goal. Nigeria's first goal (in the friendly). Then compare to the CAR game. All from the left side... Coincidence?